Recommended If You Like: LOUISVILLE! LEXINGTON! “JOVANTAES are Lexington, Kentucky. They emerge from (and possibly define) my town’s peculiar skate/Kraut/nihil/garage axis, evoking the smell of stale Miller High Life and burning couches: stumbling match-grip surf rolls, howling chorused-out guitar, droning Adderall haze, and a singer who makes Will Shatter sound like Scott Walker. Imagine Moolah playing at a beach party on the edge of the Kentucky River, big gray globs of unidentifiable garbage drifting silently past and the dense wet air becomes gridlocked with mosquitoes” – Trevor Tremaine, Hair Police, Attempt. 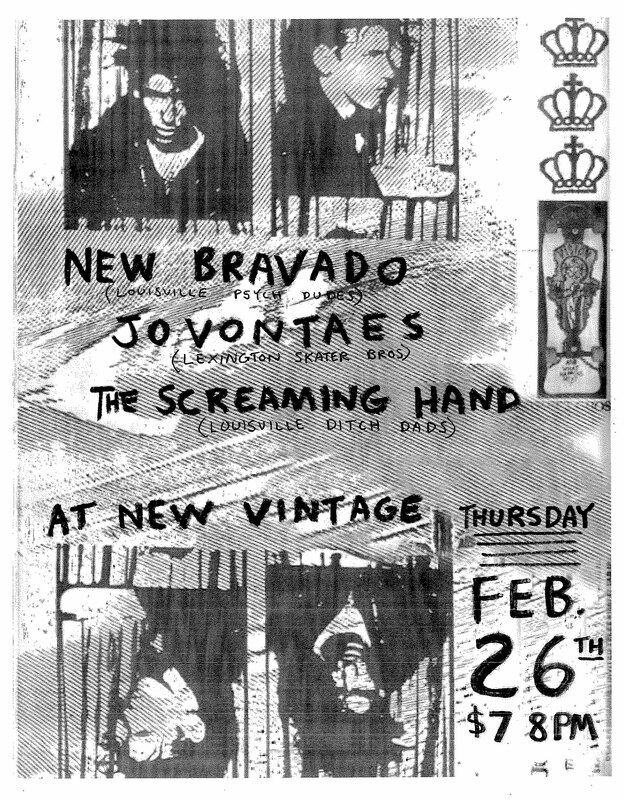 THE SCREAMING HAND is a Louisville punk rock four-piece band consisting of Jason Gainous, RJ McCoskey, Bryan Burns, and Andy Collins. They write, “We all played instruments and skated together, so we figured we should start a band. That’s what we did. In a basement. Like children.” Recommended for fans of Drive Like Jehu, Witch, Fugazi, Black Flag, Rodan, Slint, Maximillian Colby, Minor Threat. And SKATEBOARDING! This entry was posted in Activities, Beer, Bourbon, Upcoming Events, Wine and tagged Jovontaes, New Bravado, The New Vintage, The Screaming Hand, Upcoming Events on February 2, 2015 by othersideoflife.